Corvus Gold Inc. ("Corvus" or the "Company") - (TSX:KOR)(OTCQX:CORVF) announces it has received assay results from an additional two holes from its 2017 Phase I drilling program at the Mother Lode project in southern Nevada (Table 1). 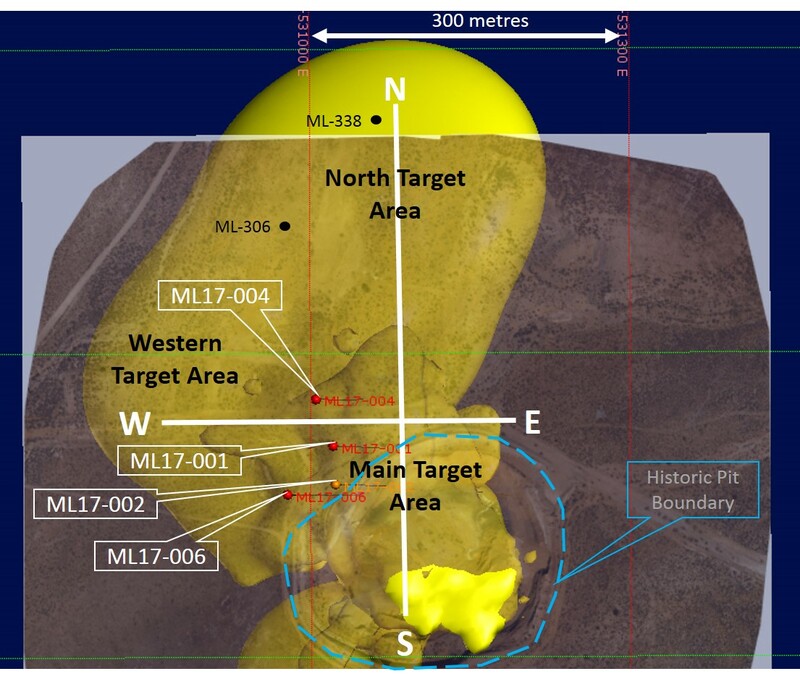 The results for the Main Target area (Figure 1) are continuing to confirm the Upper and Lower Zones of the deposit as well as the down dip extension of the high-grade Mother Lode Structural Zone. 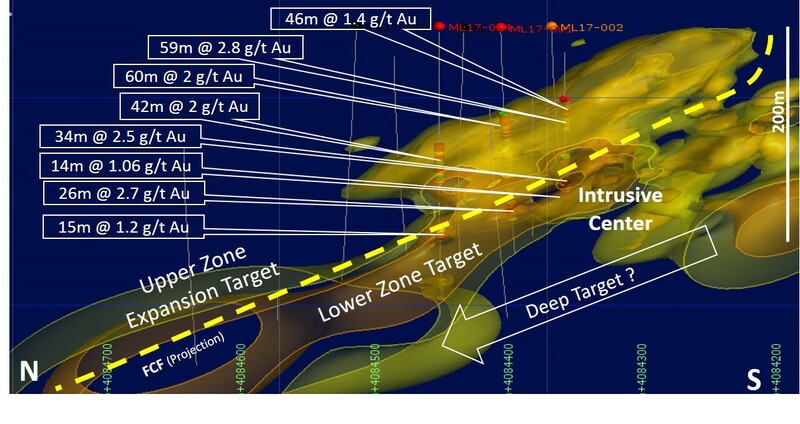 The Company believes that these new results, along with ongoing geologic studies show that both the Upper and Lower Zones are related to the same gold system and directly tie to the unique Mother Lode intrusive center. The system can best be characterized as a Miocene aged sediment hosted deposit similar to those of north central Nevada, although at a younger age. The Company's new drilling, in combination with the existing 172-hole historic drill database was used to construct a series of grade shells that have revealed a clearer view of the overall mineral system. These grade shells are shown in Figures 1 through 3 with the current drilling results plotted. The Upper Zone results compare well to the prior resource model and highlight a continuous sediment hosted zone of mineralization both laterally and along strike. The new Lower Zone of mineralization is also showing good continuity from hole to hole. Host rocks in both zones are predominantly calcareous sediments and intrusive dikes and sills with the Lower Zone dominantly oxide. The key structural controls on the Mother Lode mineralizing system and its associated intrusives are the north dipping Fluorspar Canyon Fault (FCF) and the north trending, west dipping Mother Lode Structural Zone. The unique intersection of these two-major regional structures has created a large area of strong fracturing and facilitated the emplacement of several dikes and sills which were contemporaneous with the gold mineralization. The high-grade Mother Lode Structural Zone commonly has dikes within it, as does the FCF. In addition, regional structural work and down hole geochemistry suggests that there could be repeated mineralized bodies at depth to the northwest of the old Mother Lode pit, which is currently being tested with a series of deep holes. Jeff Pontius, President and CEO of Corvus states "These ongoing results and recent geologic work on the property by Dr. Richard Sillitoe are beginning to highlight a new sediment hosted gold system in Nevada. We believe that this deposit is actually one large intrusive driven gold system with multiple large sediment hosted bodies of +1 g/t gold which are currently unconstrained. 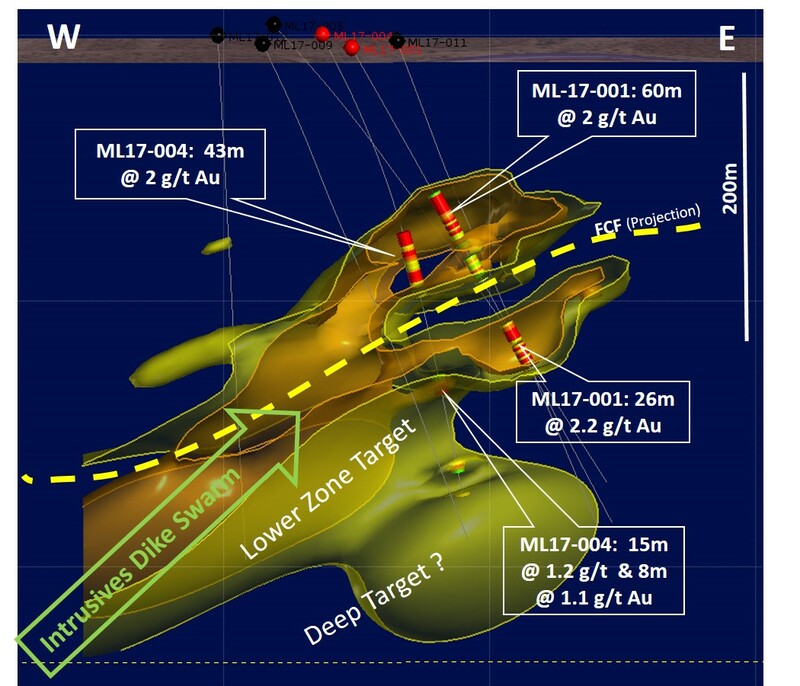 This new, near surface, high-grade, gold system has potential to expand significantly with our current drill program." The work program at Mother Lode was designed and supervised by Mark Reischman, Corvus Gold's Nevada Exploration Manager, who is responsible for all aspects of the work, including the quality control/quality assurance program. On-site personnel at the project log and track all samples prior to sealing and shipping. Quality control is monitored by the insertion of blind certified standard reference materials and blanks into each sample shipment. All resource sample shipments are sealed and shipped to American Assay Laboratories ("AAL") in Reno, Nevada, for preparation and assaying. AAL's quality system complies with the requirements for the International Standards ISO 9001:2000 and ISO 17025:1999. Analytical accuracy and precision are monitored by the analysis of reagent blanks, reference material and replicate samples. Finally, representative blind duplicate samples are forwarded to AAL and an ISO compliant third-party laboratory for additional quality control. Corvus controls 100% of its North Bullfrog Project "NBP", which covers approximately 72 km² in southern Nevada. The property package is made up of a number of private mineral leases of patented federal mining claims and 865 federal unpatented mining claims. The NBP project has excellent infrastructure, being adjacent to a major highway and power corridor as well as a large water right. The Company also controls 65 federal unpatented mining claims on the Mother Lode project which totals 522 hectares, which it owns 100% of. Corvus Gold Inc. is a North American gold exploration and development company, focused on its near-term gold-silver mining projects at the North Bullfrog and Mother Lode Districts in Nevada. In addition, the Company controls a number of royalties on other North American exploration properties representing a spectrum of gold, silver and copper projects. Corvus is committed to building shareholder value through new discoveries and the expansion of its projects to maximize share price leverage in an advancing gold and silver market. This press release contains forward-looking statements and forward-looking information (collectively, "forward-looking statements") within the meaning of applicable Canadian and US securities legislation. All statements, other than statements of historical fact, included herein including, without limitation, statements regarding the rapid and effective capture of the potential of our Mother Lode project, anticipated exploration program results, the discovery and delineation of mineral deposits/resources/reserves, the possibility of there being repeated mineralized bodies at depth to the northwest of the old Mother Lode pit, the possibility of a new sediment hosted gold system in Nevada and the potential for the Mother Lode Structural Zone to be a gold system that will expand and become the cornerstone of the Company's regional development plan, are forward-looking statements. Information concerning mineral resource estimates may be deemed to be forward-looking statements in that it reflects a prediction of the mineralization that would be encountered if a mineral deposit were developed and mined. Although the Company believes that such statements are reasonable, it can give no assurance that such expectations will prove to be correct. Forward-looking statements are typically identified by words such as: believe, expect, anticipate, intend, estimate, postulate and similar expressions, or are those, which, by their nature, refer to future events. The Company cautions investors that any forward-looking statements by the Company are not guarantees of future results or performance, and that actual results may differ materially from those in forward looking statements as a result of various factors, including, but not limited to, variations in the nature, quality and quantity of any mineral deposits that may be located, variations in the market price of any mineral products the Company may produce or plan to produce, the Company's inability to obtain any necessary permits, consents or authorizations required for its activities, the Company's inability to produce minerals from its properties successfully or profitably, to continue its projected growth, to raise the necessary capital or to be fully able to implement its business strategies, and other risks and uncertainties disclosed in the Company's 2016 Annual Information Form, as filed as Form 10-K and latest interim Management Discussion and Analysis, as filed as a Form 10-Q, is filed with certain securities commissions in Canada and the Company's most recent filings with the United States Securities and Exchange Commission (the "SEC"). All of the Company's Canadian public disclosure filings in Canada may be accessed via www.sedar.com and filings with the SEC may be accessed via www.sec.gov and readers are urged to review these materials, including the technical reports filed with respect to the Company's mineral properties.